Guru Nanak pronunciation (help·info) (Punjabi: ਗੁਰੂ ਨਾਨਕ; Hindi: गुरु नानक, Urdu: گرونانک‬, [ˈɡʊɾu ˈnɑnək] Gurū Nānak) (15 Aprile 1469 – 22 September 1539) is the foonder o the releegion o Sikhism an is the first o the Sikh Gurus. His birth is celebratit warld-wide on Kartik Puranmashi, the full-muin day which faws on different dates each year in the month o Katak, October–November. 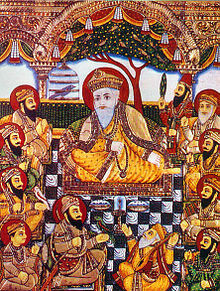 Guru Nanak was born oan 15 apryle 1469 at Rāi Bhoi Kī Talvaṇḍī, noo called Nankana Sahib, near Lahair, in present day pakistan. Frae thes point onwards, nanak is described in accoonts as a guru, an' sikhism was born. Guru Nanak’s teachings can be foond in th' Sikh scripture Guru Granth Sahib, as a vest collection ay revelatory verses recorded in Gurmukhi. ↑ Guru Nanak mey be referred tae bi mony ither names an titles such as Baba Nanak or Nanak Shah. ↑ 2.0 2.1 Dawe, Donald G. "Srī Gurū Nānak Dev". Encyclopaedia of Sikhism. Punjabi University Patiala. Retrieved 28 September 2013. This page wis last eeditit on 20 September 2015, at 18:05.